Growing in southeastern swamps; needles soft, short, in 2 rows, falling in fall; "knees" created by roots of mature trees. 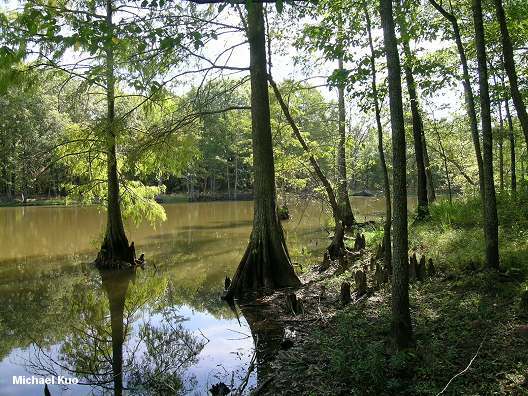 Habitat: Sometimes in pure stands but usually mixed with other swamp species in baldcypress swamps. Stature: 100-120 feet high; to 5 feet in diameter; pyramid-shaped when young, irregular or flattened at maturity; mature trees developing distinctive, half-submerged "knees" (see illustration). 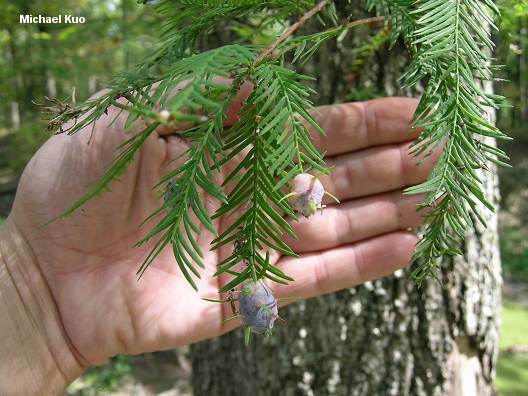 Needles: Less than 1 inch long; yellow-green; in two rows on the twig; browning and falling in fall. Bark: Variable in texture and thickness; reddish brown to dark gray. Cones: Under 1 inch; brown; scales wrinkled.